Eid Al Fitr is the day that signals the end of the 30-day fasting of the Holy month of Ramadan. 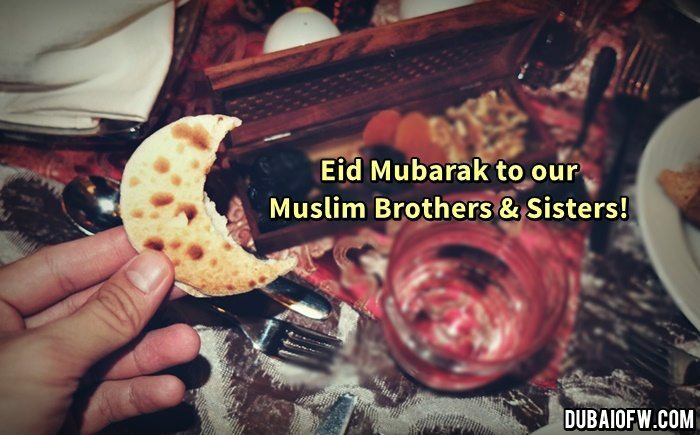 This is a time where our Muslim brothers and sisters also go out and have a feast to rejoice. This is a holiday celebration and it is a non working holiday for the government and private sector. Applicable holiday pay is rendered to those who are working during these dates. Regardless of the paid holiday, it is good to know the true meaning of this event and celebrate Ramadan for its meaning. How to Greet our Muslim friends during Eid – Meaning of Eid Mubarak! So we greet each other “A Blessed Celebration!”. Happy breaking of the fast! Summer in Dubai is also coming so be prepared for the climate. It will only be for a few months. Don’t fret to stay hydrated!